During the year ending 7/1/18, the US population grew by 2.02 million or 0.6%, the slowest pace since 1937, and now totals 327.2 million. The excess of births over deaths resulted in an increase of 1.04 million persons, while immigration accounted for an increase of 978,826 people, or 48.5% of all growth. 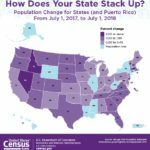 The fastest growing states: Nevada and Idaho at 2.1%, Utah at 1.9%, and Arizona at 1.7%.